It’s fall at New College of Florida and that means Orientation. But this year’s incoming first-year and transfer students are the first to experience something entirely new, not only for themselves, but for New College. They are taking part in a First-Year Experiences Program, led by director Jessica Maxon, welcoming and introducing them to all things New College. Her goal is to set them up for success, showing them the community ropes and resources, on- and off-campus. The majority of the 277 first-years and transfers are from Florida, but this year, students come from twenty-six other states including Massachusetts, Texas and as far as California and Washington. There are also students from three different continents, including Palestine, Brazil, the United Arab Emirates, and Sweden. The incoming class is well-performing with an average grade point average of 3.95. 35 percent of the class is in the top 10 percent of their high school graduating class and 64 percent is in the top 20 percent. New College students are defined by their ability to think for themselves, and Maxon wants the First-Year Experiences Program to help students use that to their advantage. A first-year student gets some direction from an Orientation leader in Sudakoff Center. So while students are learning how to use campus resources, attending important discussions, playing retro games in the library, drinking “mocktails” by the bay, and putting on short plays in the Black Box Theater, they are also having serious conversations with their orientation leaders about how orientation is working for them individually and as a group. This year, the focus will be on learning through discussion. That’s how New College students learn in the classroom and Maxon wants to encourage them to do that from the start. Orientation groups are set up as small communities within the larger campus community, resulting in new students asking questions without fear of judgement or discomfort. Maxon shares her goals with new Dean of Students Robin Williamson (see Just for Families in this issue), who has been working with her to prepare for the incoming class. 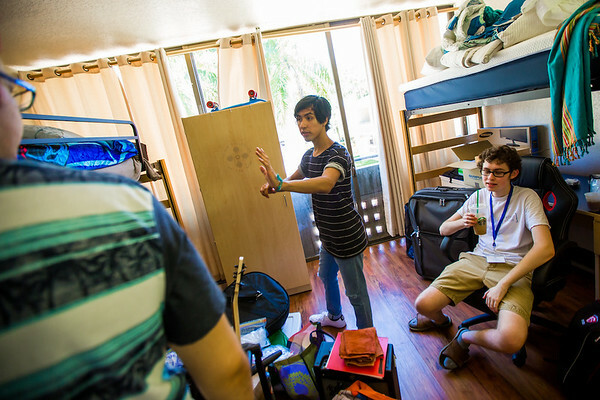 First-year students organize their dorm room during Orientation. Much like Maxon, Williamson wants to listen to students’ concerns and work with them to enhance New College and the experiences which it provides. She is determined to meet every New College student by the end of the academic year. While Maxon and Williamson have been impressed by the students they have met, they also see them as sources of inspiration.